On a Personal Note: Showered with Gifts! I treasure my new nutmeg grater. On Wednesday, I braved the rain and the wind to go to Whisk, a delightful kitchen supply store in Brooklyn. I won a $25 gift certificate earlier this month, so I arrived with a list of small items I needed for my kitchen. It warmed my heart to be able to pick out some tiny treasures. I got: A beautiful roll of brown parchment paper, which I think I may use to wrap my Christmas presents; a cookie cutter in the shape of an oak leaf and a jar of silver sanding sugar (also for Christmas presents); a candy thermometer, a tea ball, and (best of all) a nutmeg grater. 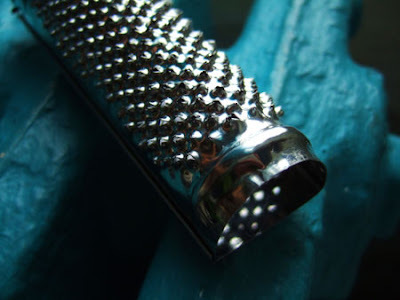 I have wanted a nutmeg grater for years, and the one I got at Whisk is truly special. This nutmeg grater is the same make that I used in my other life in 1848. Hanging on a rack of completely modern and ordinary kitchen utensils, its punched-tin design seemed terribly out of place. I snatched it up and cradled it; I love it so. When I returned home, a package had come for me in mail. A reader of this blog had mailed me some cookbooks: a two-volume set of 15th Century recipes called Take a Thousand Eggs or More by Cindy Renfrow. This reader had bought them several years ago at a renaissance festival, and never got around to using them. She decided they needed a new home. I haven’t done much work with Medieval or Renaissance cookery, but upon scanning the index, the heading “Spectacle Foods” caught my eye. The first entry: “Appraylere: a false pitcher made of pork, cheese and bread.” What??? Meat Pitcher? Awwwwwesome! Box of meat! Sarah Lohman, your ship has come in. Lastly, yesterday morning the Fed-Ex truck arrive with a box of free meat. How this free meat came to be is a long story, but it’s fromD’Artagnan, a local purveyor of elegant products. 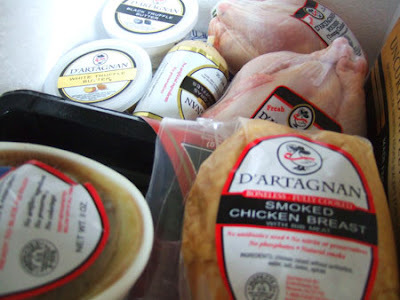 I got two tiny chickens, heritage breed bacon, buffalo steaks, duck foie gras, and two types of truffle butter. I’ve never even owned a truffle before! Recently, I’ve been reading The First Ladies Cookbook: Favorite Dishes of all the Presidents of the United States. It was printed sometime around 1976, in the history-loving fervor surrounding our bicentennial. I’m always a little suspicious of historic books printed in this era, as the research often seems a tad sketchy. But TFLC (as it shall hereby be known) seems fairly trustworthy, and has footnoted its references. I always appreciate a good footnote. I learned a few interesting facts after glancing over the introduction, “Notes on Early American Cookery.” It speaks of the early housewife, who regulated “…the temperature (of) the Dutch oven so that she would not have a ‘sad cake…'” Meaning: a cake that was baked unevenly, so that it was tragically lopsided and irrevocable burnt. A sad cake! Aw. 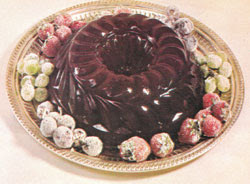 I also discovered a thing or two about Gelatin: “Gelatin was made from calves’ feet, or from a product called isinglass, taken from the swim bladders of fishes…In the elaborate molded desserts they gave a meaty or fishy flavor to the pudding.” Jee-sus. Additionally, I found out Thomas Jefferson was not only quite the gourmand, but also a consummate host. I’ve added this new knowledge to my list of reasons to love Jefferson–in fact, thinking of him makes my heart flutter. Being a widower, Jefferson would occasionally call upon the aid Mrs. Dolley Madison, the wife of his secretary of state. She seems like she was a real firecracker–she saved all those paintings and popularized ice cream! One of Jefferson’s favorite recipes was Wine Jelly, which is exactly what it sounds like: booze-flavored Jell-o. I think I’m going to try out the recipe, although I will probably use unflavored gelatin for simplicity’s sake, instead of extracting isinglass from the swim bladders of fishes. Other presidential favorites: Martin Van Buren loved Huguenot Cake, an apple torte I’ve been jonesing to bake. 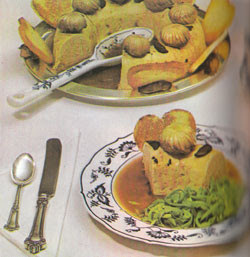 Grover Cleveland was fond of “Turban of Chicken, Cleveland style,” a molded pate-style ring made from mushrooms and mushed chicken pieces. And Benjamin Harrison’s favorite dish? Pigs in a blanket. Who can blame him? brewed with lager yeast (bottom fermenting), but at ale temperatures (55-75 degrees). This is not uncommon for a style of the 1800’s — in fact, the Steam beer, known as the California Common to non-Anchor breweries is done the same way. I believe this was done to give beer fans something to drink while waiting for their lagers, the favored beer style of the time. This beer was very popular in the midwest, and was known as a “common” due to the ordering style of the time. If you asked for an Ale, it was likely that this was what you got, unless the establishment also made their own beer. In that case, you got a “Rare Ale”, which was completely different than the “Common” style of the region. The recipe taken from here and interpreted into a much more readable recipe was a very simple brew. With 7 lbs. of base malt — in this case, American two row malt, a very simple, clean tasting malt — added to 3lbs of flaked maize gave a very corny scent. If you’ve ever smelled the water left over after making steamed corn on the cob, you’ve smelled how this beer smelled while mashing, and understand why I didn’t want to drink something that smelled that terrible. Thankfully, when hops were added (another American hop that would have been around at that time, Liberty, a noble hop with a very balanced smell as well as aroma. It’s not too hoppy as an IPA would be, and it’s not so weak as to just blend into the background.) the smell changed, considerably. The sweetness of the sugar in the corn took over, and mixed with the hops, the beer turned from boiled corn water to a delicate corn flan, with notes of cornbread in the boil. Two weeks later, I put it in a keg and forgot about it for a week and half, to allow the beer to come up to gas, as well as give it time to mellow. Beer taken directly from the fermenter into a keg is drinkable, but, tastes green. The flavor profile never has time to develop, and as a result, the beer is a mishmash of what it’s flavor is going to end up being, the notes of the chord so to speak, woefully out of tune. Now that it’s come together, the taste is wonderful. I imagine this as what the Busch, Miller and Coors families were inspired by in the Midwest. The nose is sweet, very unbeerlike with an effervescence not unlike a champagne. The taste is very earthy, and there’s a piquant balance of the hop, maize and malt which swirl on the tongue in an almost sweet way. This is definitely not a savory beer, something strong and manly. At just 4.8% ABV, the beer is smooth, and quaffable, and with each sip, I almost hear a horse whinny as Sam plays something on the piano in some midwestern tavern somewhere down near Cincinnati. Pete adds as an addendum: “There’s a book called American handy book of the brewing, malting and auxiliary trades. It’s out of print, but freely available on Google books. Unfortunately, the Common vs. Rare bit is anecdotal from a brewing forum I go to. One of the gentlemen is in his seventies, and his grandfather would take him to his local tavern and order the “Common Ale“, and when he had an extra dollar in his pocket, the “Rare Ale”. It could be local to where he grew up (Northern Kentucky) rather than something that was done everywhere. Thanks for sharing, Pete! I can’t wait to quaff some the next time I’m in Cleveland. The Merchant’s House funeral reenactment processes down The Bowery. I’m attending an interesting event this week at the Merchant’s House Museum called From Parlor to Grave: 1865 Funeral Reenactment. The parlors will be draped in black crape as we recreate the 1865 funeral of Seabury Tredwell. After the service, mourners are invited to follow the coffin to nearby New York City Marble Cemetery – rarely open to the public – for a tour. 19th-century mourning attire encouraged; black crape armbands will be provided. $15, MHM Members $10. 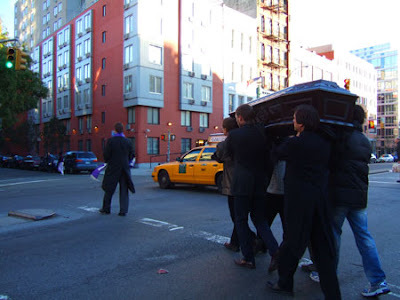 I went several years ago and thoroughly enjoyed myself: there is a fake corpse of Mr Seabury Tredwell; visitors are asked to participate in the period appropriate funeral ceremony; and then (my favorite part) the casket is carried from the from door of the museum, down the Bowery to the cemetery. The juxtaposition of the 1860s funeral processionand the hustle and bustle of modern day New York is mind-blowing. Thinking about the funeral got me interested in doing some research on Funeral Cakes. Also known as Doed Kokes, funeral cakes were a large, hard cookie that was given out as a memento of a funeral (Zanger, 45). The cookies were molded much like a Springerle cookie and were flavored with caraway seeds. Although they were largely a Colonial Dutch tradition (Zanger, 45), their recipe appears under the name “seed cakes” in many 19th century cookbooks. I had one of these cookies at a funeral reenactment in Ohio and remember it tasting awful. The caraway seeds gave it a taste distinctly reminiscent of pepperoni. Then again, the cookies probably weren’t ever intended to be eaten, but rather preserved for years as a testament to the memory of a loved one. On a similar note, I wanted to share with you a little treasure my Mom found at a flea market over the summer: a collection of funeral cards for the 1850s and 60s. They were a memento distributed in the same way as a doed koke. I’ve scanned these cards and made them available on Flickr. Take the time to browse them: each one is unique and different, and several of them are truly beautiful in their level of detail and intricacy. UPDATE 10/25/2009: I took a bunch of photos at the reenactment today, take a look! A few weekends ago, I was awarded Best in Show at the Havemeyer Sugar Sweets Festival, a fundraiser for the City Reliquary. I was especially proud of my prize because the recipe that won, Chocolate Puffs, is one of my favorite creations. 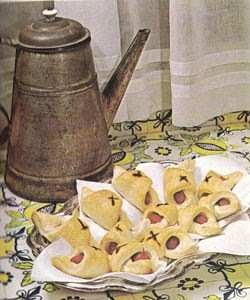 I first came across the recipe for Chocolate Puffs in The American History Cookbook, an excellent resource by Mark H. Zanger that uses food to teach cultural history. That’s right up my alley. Take a pound of Loaf Sugar, beat and Sifted very fine, 2 Ounce of Almonds blancht and beat very fine with a little Orange Flower water or any other, to keep them from Oyling, but not to make the same too thin, take 2 ounces of Chocolet and grate it, then mix it well together, the take the wfite of an Egg and beat it to a froth, if one be not Enough take a little more, then beat it well to a paste & Squert it, and do it on Slight paper and Set the same in an oven after Bread, of Chocolett Ditt it up a while but not for White ones, for fear of making them brown. I realized this recipe was the perfect vehicle to try out the block of American Heritage baking chocolateI had picked up on my recent trip to Washington DC. American Heritage is chocolate produced by the Historic Division of Mars, Inc.
“The Historic Division of Mars was established in 2006, with the vision of becoming the undisputed leader in chocolate history. Our mission is to relentlessly pursue and share chocolate’s rich past, by creating authentically historic chocolate experiences that allow our consumers to enjoy the fusion of chocolate history and Mars Chocolate excellence. It’s “Handcrafted chocolate made from an authentic colonial recipe…available during the 17th century.” I’m a huge nerd, so when I discovered that there was an authentic historic chocolate being produced, I was beside myself with excitement. 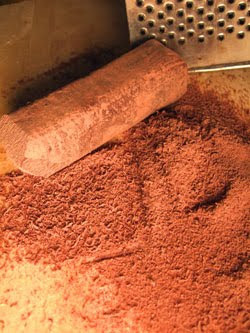 Early chocolate was produced sweetened cakes and sold as a spice. Until the later half of the 19th century, it was primary served as what we know of as hot chocolate. My block of American Heritage chocolate is about 5 oz of pressed cocoa, delicately spiced with anise, red pepper, nutmeg, orange and cinnamon. It seemed only fitting to feature the unique taste of this chunk of chocolate history in my recipe for Chocolet Puffs. If I’m reading the Chocolet Puffs recipe correctly, it gives you an option of melting the chocolate before adding it to the whipped egg whites, but primarily advises you to simply grate it and stir it in to the meringue, much like you would use a spice. 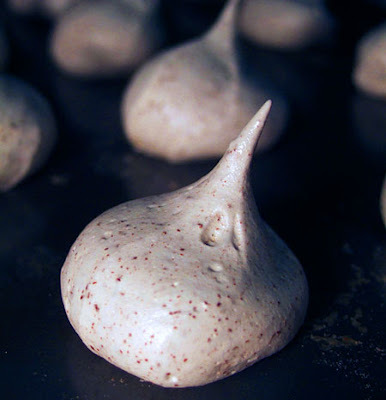 I searched for a comparable modern recipe to use as a jumping point for my baking process: I came across a wonderful recipe for Chocolate Meringues in Martha Stewart’s Cookies that stirred shaved chocolate into a Swiss meringue; a concept incredibly similar to my 18th century recipe. From a manuscript housed at Tyron Place, as published in the American History Cookbook. 1. Preheat oven to 175 degrees. Combine egg whites, sugar, cream of tartar, salt and orange flower water in a heat proof bowl of an electric mixer. Set in a double boiler. Cook on a low heat, whisking constantly, until the sugar has dissolved and the mixture is warm to the touch. 2. Transfer bowl to electric mixer fitted with a whisk attachment; beat starting on low speed and gradually increasing to high, until stiff, glossy peaks form, about 10 minutes. 3. Gently fold in chocolate, taking care not to crush the meringue. 4. Transfer meringue to a pastry bag, or (like I did) a Ziploc bag with one corner cut off. Pipe quarter sized, “kiss” shaped cookies onto a non-stick cookie sheet, or parchment lined cookie sheet. 5. Bake cookies for two hours. *Orange Flower Water can be found in Middle Eastern grocery stores; I live in an ethic neighborhood, so my local grocery store carries it, along with three different brands of Rose Water. It is a historic gastronomist’s paradise. And that’s all there is to it. The process is time consuming, but simple. The results: a depth and intensity of flavor I would not have thought possible from these crispy, sweet little puffs. 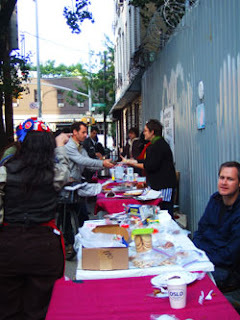 Events: Havemeyer Sugar Sweets Sale Wrap Up! Jumbles, stacked and ready to eat! This post is belated, but I wanted to share the results of the Sugar Sweets Festival last weekend. I made about 300 cookies, wrapped in snazzy packages of three, and 90% of them sold! I was thrilled, not only to make a little money for the Reliquary, but because I was afraid the recipes I selected would be too strange for the modern pallet. On the contrary, they were a big hit. I worked on a simple, professional package design. 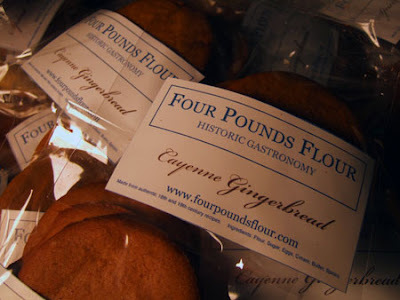 authority in culinary matters suggests the addition of a little cayenne pepper in gingerbread. Whether it be advisable to use this latter ingredient or not, we leave to our readers to decide.” I say YES, Mrs. Beeton! The gingerbread cookies I baked from her recipe were familiar, yet spicy and complex, with a little kick to the aftertaste. They received rave reviews at the bake sale. 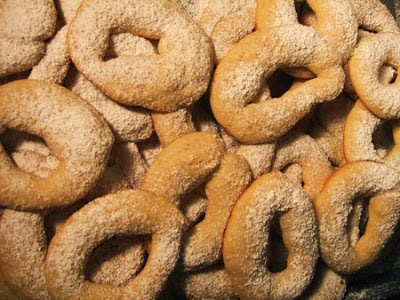 I also baked up a batch of Jumbles, a mid-19th century butter cookie, that are rolled in a loop and sprinkled with powdered sugar. The recipe comes in endless variations; I decided upon a batch flavored with lemon and mace. I attempted a few dozen Almond-Rosewater Macaroons as well. Although I thought they were the tastiest, the cookie was too delicate to survive transport to the bake sale. Most of them crumbled upon arrival, and did not look as fetching as they could have. The recipe needs work, but I think it still has potential. 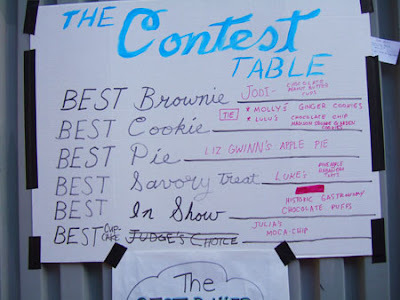 The most pleasant surprise of the day was finding out the my Chocolet Puffs, an 18th century meringue cookie, won Best in Show in the baking contest! My prize was a $25 gift certificate to Whisk, a cooking supply store in Brooklyn. I think I might use it to invest in a pair of cookie sheets; I’ve been baking on borrowed sheets! I was delighted to be a part of the Sugar Sweets Festival. It allowed me to work the kinks out of my recipes and to develop sensible packaging for my product. Most importantly, I discovered that people actually liked these cookies and were interested in their story. I don’t know where these lessons will take me next, but I’m willing to keep going. Next: The story behind my award-winning Chocolet Puffs. Tonight I Met John Cleese. I shook Mr. Cleese’s hand. He waggled a bacon-wrapped hors d’oeuvre at me. “…Angels on Horseback have a date in the middle. Devils on Horseback have chicken liver.” He commented. “That’s what’s in these?” I asked, shocked. The tray had been labeled ‘Devils on Horseback.’ I was amazed I had been so delighted by a part of the chicken I normally throw away. “Ah.” I said. Mr. Cleese excused himself. I got another gin and tonic. 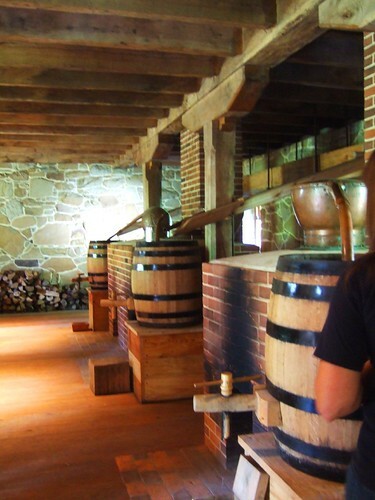 The Whiskey Distillery at Mt Vernon. On day two of my travels in our nation’s capitol, I piled in the car with my friends Bryan and Katie, and made the drive to George Washington’s home, Mt. Vernon. 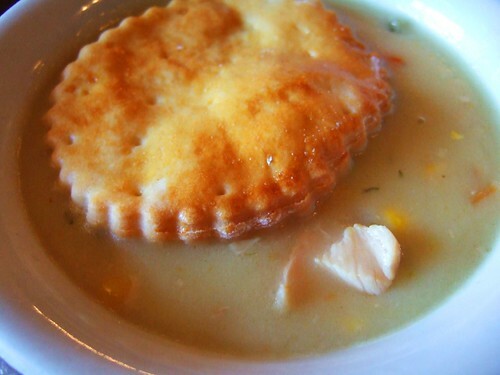 I had the “Colonial Turkey Pye,” (the “y” makes it old timey) which was ok, but unimpressive. I think the vegetables were from a frozen bag mix, and it had a giant Ritz cracker hat. Bryan had a cup of peanut soup, which I had tried before at the cafeteria at Gettysburg. I had liked it at Gettysburg, but here it tasted like warm peanut butter. Gross. The main disappointment was that the menu had foods that could have been eaten in the 18th century, like roasted chicken and corncakes, but the foods weren’t at all different from what we eat today. There wasn’t even an effort to use spices appropriate to the 18th century. It’s dull; I never understood why “historic” restaurants never make the effort to offer interesting, delicious historic food. We spent a few hours touring the grounds, and took a fairly boring tour of the Mansion itself. The house sees a high volume of visitors each year, and the staff handles this by scooting a continuous line of tourists along a velvet-roped route through the interior of the building, while reciting the interpretation for each space on a continuous loop. You would enter the room at the beginning of the interp, and leave approximately when it would start repeating. It was weird. One fact did catch my attention: Washington died suddenly of an inflammation of the throat, that suffocated him in 36 hours. I got a little freaked out when I felt a cold coming on a few days later. Next, we went to Mt. Vernon’s second site which features a reconstruction of Washington’s Gristmill and Distillery. I had been looking forward to visiting the recently opened distillery for awhile, and it really was a treat. A knowledgeable interpreter talking us through the distilling process while we toured a truly beautiful building. I learned that in the 18th century, whiskey was made from rye, with a little corn. 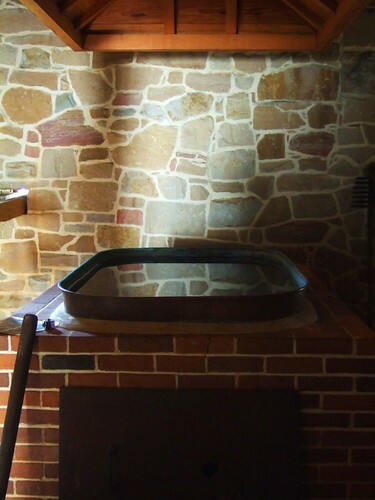 It was not aged; the entire distilling process took only two weeks before it was casked and sold. The liquor was clear, and our guide described it as tasting surprisingly sweet. Mt. Vernon will begin selling its whiskey sometime in the next year, and I am excited to try it when they do. The gristmill was also neat, as gristmills are. Every time I stand before a spinning water wheel, and all those gears and grindstones, I’m impressed by human ingenuity. Who thinks of these things?? 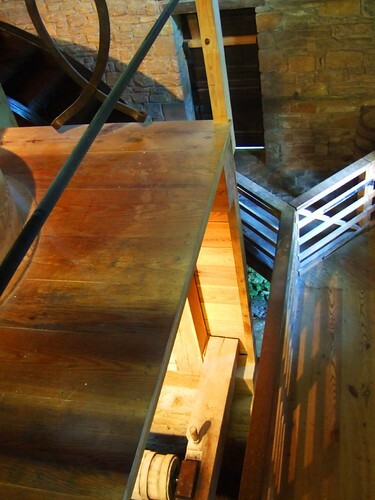 Looking down from the second floor of the gristmill, to the stream below. I picked up a little souvenir treat for myself: a 5-ounce block of American Heritage Chocolate, a product of the Historic Division of Mars, that is made from an authentic Colonial recipe. I’m going to use it to make “Chocolet Puffs,” a receipt from a 18th century manuscript that is one of the earliest instances of chocolate being used in another manner than for drinking. If the recipe turns out well, they will be sold at The City Reliquary’s 1st Annual Haveymeyer Sugar Sweets Festival on Saturday. But more on that tomorrow. See more images from my trip below. This is what $27 gets you at the Mitsitam Cafe. Over the weekend, I spent a lovely couple of days with friends in Washington, D.C. Aside from general revelry (it was so good to laugh again), I couldn’t resist the opportunity to go on a few historic food adventures. My first stop was the Museum of the American Indian, which houses the Mitsitam Cafe, a lunch-time spot with an interesting concept. 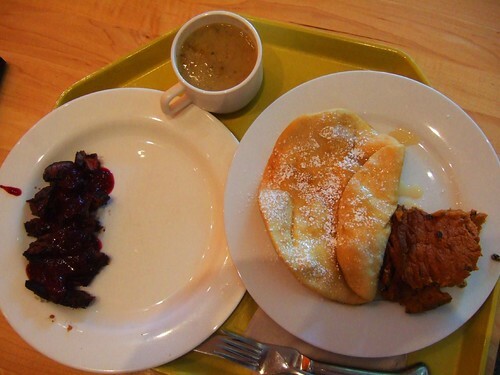 The Cafe offers food inspired by the traditional dishes of five different Native American regions: Northern Woodlands, The Great Plains, Northwest Coast, Meso-America and South America. Pretty neat, huh? The Cafe came highly recommended, so I trudged over to the Mall to check it out. Each of the regions is set up as a separate station, with a selection of entrees and sides. I selected a bison steak from the Great Plains, which was made to order on a fancy grill and served with a cherry chutney. For my sides, I opted for pan fried bread from Meso-America and a pumpkin spoon bread from the Northern Woodlands. Also from the Woodlands, I got a cup Jerusalem artichoke and chestnut soup. My steak is cooked to order. 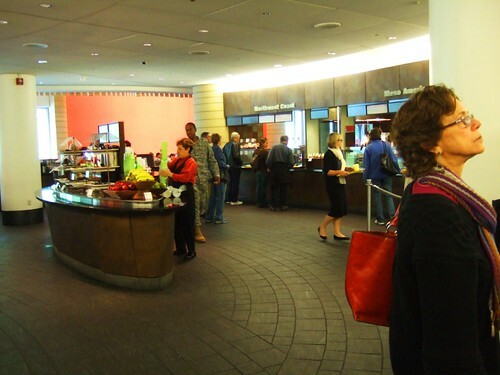 Although I was excited by the variety that the Cafe offered, I had to stand in a separate line for each station. And I happened to get to the cafeteria behind a rush of very old men and very small children, neither of which could make of their minds. By the time I got to the cash register, I was hungry and impatient–and then imagine my surprise when my meal totaled $27. 27!! Twenty-Seven Dollars!! For lunch! This is a recession! The best restaurants in New York are offering pre-fixe lunches for thirty bucks a pop. How did I manage to spend that in a cafeteria in DC? Disgruntled, I took my tray to a seat, and began sampling the dishes. The steak had a good char on it, but was ice cold. 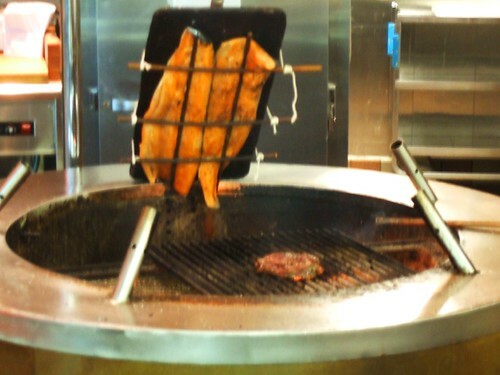 While it was being cooked to order, the chef had told me to come back in a few minutes. When I did, he had sliced it into nursing home slivers and covered it in cherry chutney. The result–ice cold steak covered in fruit. The Jerusalem artichoke soup was so salty it was inedible, and the texture of the chestnuts was appalling. The pumpkin spoon bread was ok, with a taste that resembled pumpkin pie, but with a grainy texture. The best thing on my plate was my fried pan bread, and even that was so chewy I think I got TMJ. To be fair, I may have just come on a bad day, or made bad selections. But I would never go the Mitsitam Cafe again. Feeling ripped off, I went next door to the Air and Space Museum and spent a few moments in the foyer gazing at some of man’s most spectacular achievements. Then, I comforted myself with a bag of Spaceman Ice Cream. I have very fond memories of Spaceman Ice Cream. I would get a package every time I visited the Cleveland Museum of Natural History as a kid. I continue the tradition by purchasing a bag whenever I can, and the flavor never fails to bring me back to my childhood. 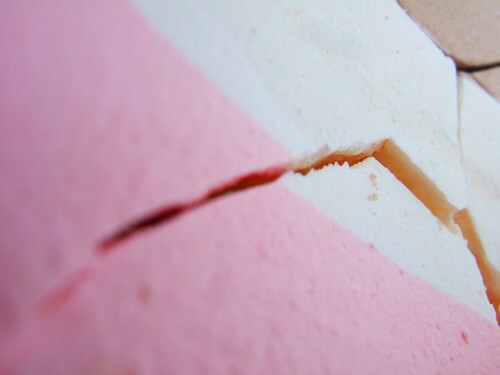 My thoughts travel far off into space, where I think of astronauts chewing away on the same neapolitan block. I actually don’t know if Spacemen eat, or have ever eaten, Spaceman Ice Cream. But I think enjoying this crispy sweet as a kid was the first time that food helped me understand another way of life. Day two of my adventures tomorrow.